The keepers of Quebec City have a sense of humor, or so it seems. On every tourist map there is a pointer to Passage du Chiens, or Dog Passage and people flock to see it. Well, maybe not flock as it’s down the street from lots of other stuff and they simply see it as they pass by. But there it is, complete with official street sign – Passage du Chiens. It is a passageway to a road/parking area for residents who live in the area and whose house fronts on a ‘street’ that is no longer a street but rather a walkway for pedestrians. And the Passage du Cheins does sit between two art galleries that are quite photogenic and so many photos are taken of the spot. I suspect dog lovers get a kick out of showing it to their friends. Towards the end of our outdoor sketching season I was wandering around, trying to get in some last minute plein air sketching, and I decided to sketch this famous landmark. The sun was bright, which was great because the temps were just above freezing. Before I finished, though, the sun had moved behind the buildings, shading the entire area. This, and the fact that I’d been sitting for an hour caused me to be quite cold so I quickly snapped this photo and moved on to find more sunny ground. And then I completely forgot about the sketch, until today. I decided it was time to add some color and this was the result. Hope you like it. 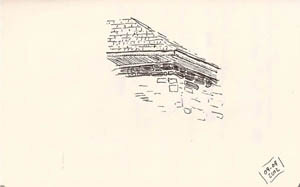 It was done in a Stillman & Birn Alpha sketchbook (10×7) and a Pilot Prera pen filled with Noodler’s Lexington Gray ink. 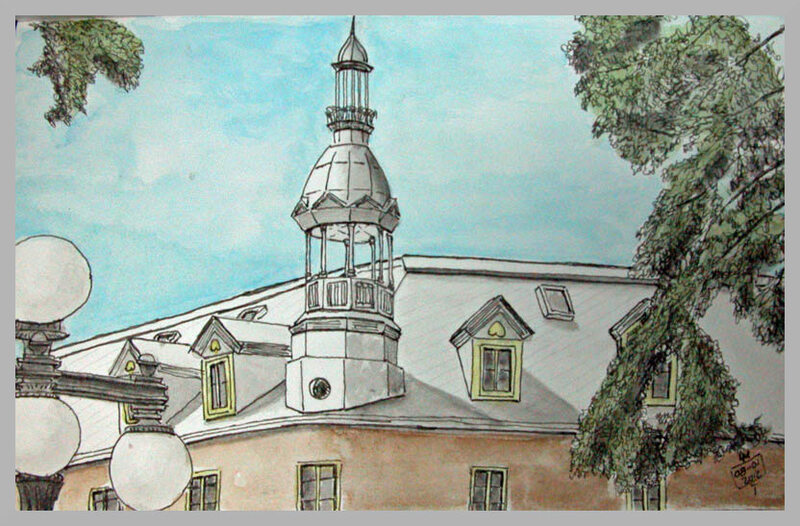 Winter has been slow in coming to Quebec City, which has been great for those of us who like to sketch on location. 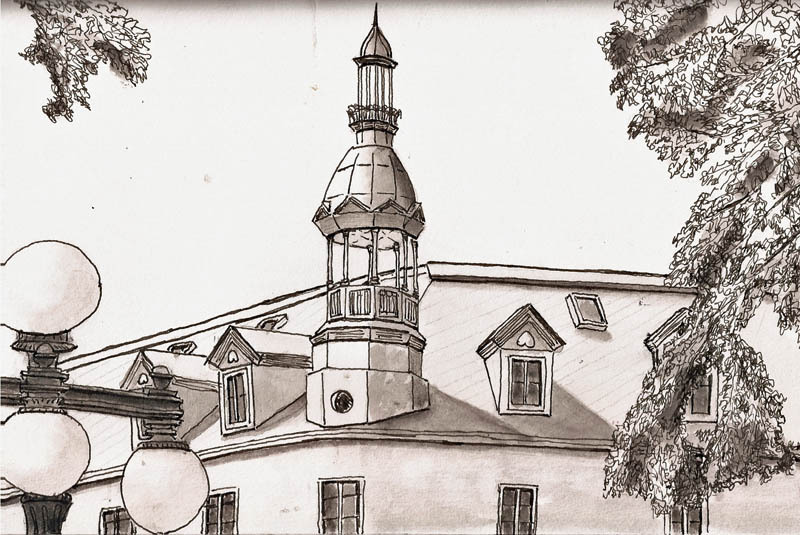 I’ve gotten at least an extra month of sketching my favorite subjects, the buildings of Quebec. 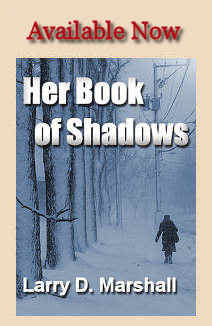 But winter has arrived and as I write this it’s 11F (-12C) outside. This is just the beginning, as we’ll soon be experiencing much colder temperatures. So what’s a location sketcher to do? Common recommendations are to go to libraries, coffee shops, airports, and train stations. These are all great if the things you want to sketch are people but even then, these places tend to be people in motion, something that’s hard for the best sketchers and impossible for me. I’m the slowest sketcher on the planet. But now that winter has set in, I’ve got more places and things to sketch than I ever thought possible. They’ve come in two forms thus far: museums and free concerts/events. There are a bunch of museums in Quebec City. In addition to the large museums like Musee des Beaux Arts and the Musee de la civilisation there are numerous smaller museums scattered around the city, principally because this is a tourist town. Each has sketching opportunities and I expect to live in them this winter. 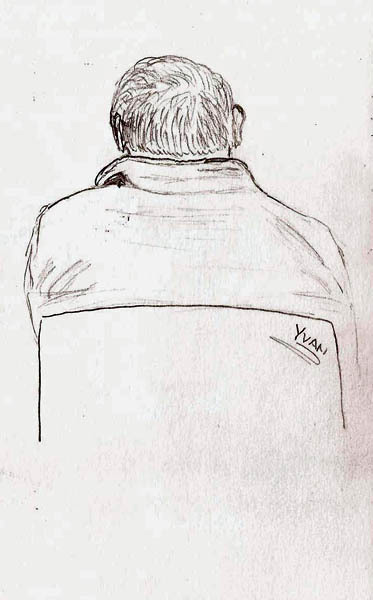 In particular, I’ve become a member of the Musee de la Civilisations as it seems the richest source of things to sketch. Right now there are displays of Nigerian art, Maori culture, Samouri armor, swords, and helmets, and a wide variety of permanent displays of Canadian and Quebec cultural people, places and things. And they’re very friendly to sketchers. There’s a cafe where you can get soup, tea and sandwiches. And, in a world with snow and cold outside, it’s warm. My first adventure there was done with my buddy Yvan Breton. We went on ‘free Tuesdays’ and expected to find the place crowded with people taking advantage of the freebie. 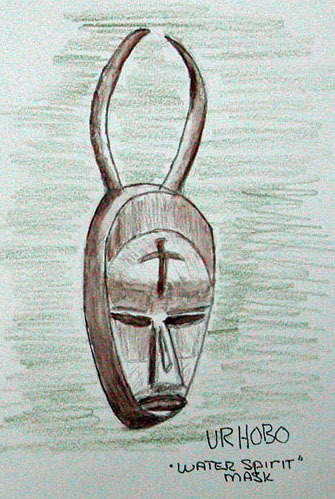 But we went in the morning and it wasn’t really busy so we set up in the Nigeria display and started sketching. 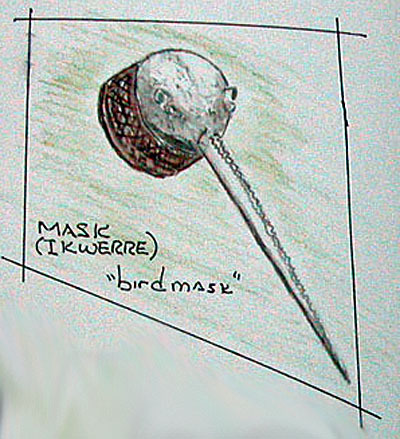 I sketched some of the masks, doing them in a fairly small size and doing them fairly quickly. I just wanted to get a feel for sketching in the museum and I wanted to save time to walk around to look at all the exhibits. We had a great day. Cities have events going on constantly. I’m not talking about Justin Beiber coming to town or NASCAR races. I’m talking about smaller events. A fashion show at the mall, school plays, an author signing event, club displays, craft shows, holiday events, etc. All of these provide things to sketch. Here in Quebec City there are also a bunch of free concerts, many put on by our music conservatory, where advanced students gain stage experience. 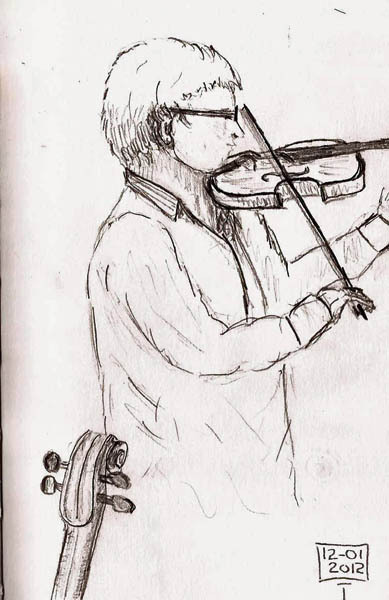 I’m new to these and time will tell but they’re a great opportunity to sketch people, the musicians and spectators as they don’t move much for extended periods of time. A small sketchbook and a pencil are unobtrusive and just the thing. I initiated my new Stillman & Birn 4×6 Alpha series sketchbook at the last one. What could be more enjoyable than to listen to great music while you sketch? I spent a delightful 1 1/2 hours listening to some truly gifted violinists. I’m going to use these concerts to practice my people quick-sketching skills. It’s a cinch I need the practice, don’tcha think? What are some of your favorite winter sketching locations? 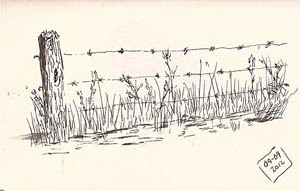 I’ve just finished my first summer as a “plein air” sketcher. 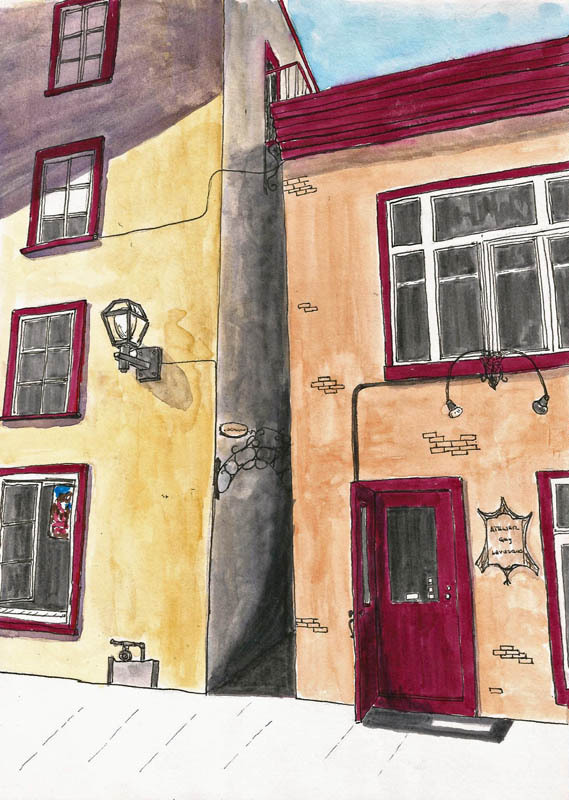 I so passionately wandered the streets of Quebec City with a sketchbook that I’ve not spent enough time reporting on those activities in this blog. My productivity as a writer has been excruciatingly close to zero. But I have had sooooooo much fun this summer. 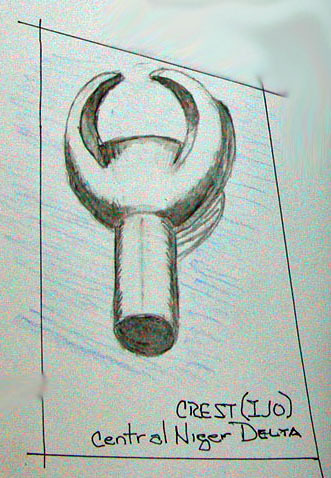 Sketching has changed my views of everything. But for five months of the year Quebec City becomes an icebox. I don’t mean it gets a little bit cool. That happened when I lived in Arizona. I mean it gets the kind of cold that causes tires to go clunk, clunk, clunk as you roll down the street as the rubber stiffens while the tires sit. I mean the kind of cold where you have to plug your car in at night so it will start in the morning. I mean the kind of cold that causes polar bears to hibernate. Like squirrels gathering nuts, we run around this time of year, preparing for our own hibernation in warm, cozy huts and with the exception of a few crazy people who like to ski and skate, we see “outdoors” only when forced to shove a snowblower around the driveway. But, with my new found hobby, this is unacceptable. I want to sketch. Yes, I can draw coffee cups and sofas but that’s not who I am. 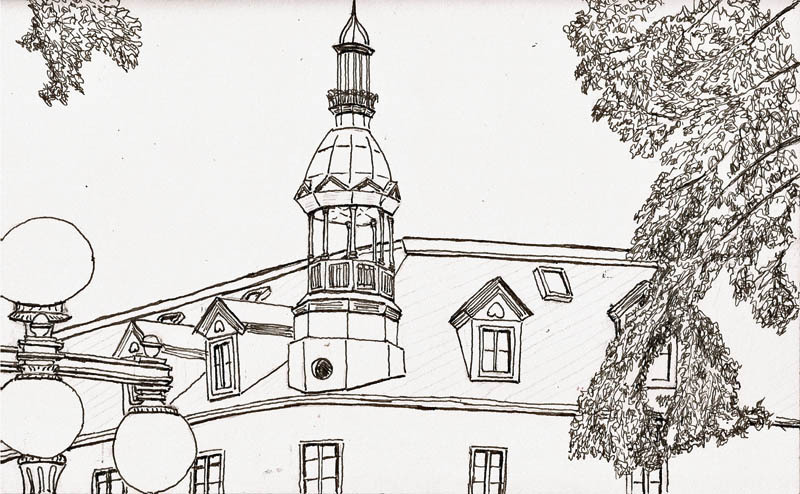 I like sketching places. So, how do I get past the reality that watercolors freeze when subjected to Quebec City winter temperatures? Clearly the watercolors will have to be left behind, but a pen and a small sketchbook can be crammed into a coat pocket. 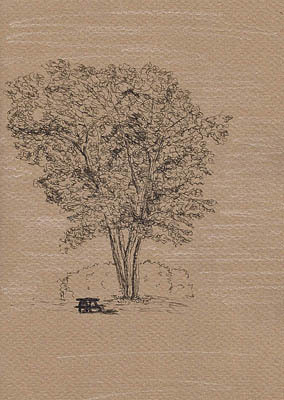 I’ve got small versions of Stillman & Birn’s Alpha series sketchbooks on their way. I may even move from my favorite fountain pens to a gel pen or…shudder…maybe even a pencil, to simplify the toolkit. I’m excited. As the leaves fell from the trees, my stomping grounds have revealed a whole new landscape, just waiting to be sketched, with or without color. 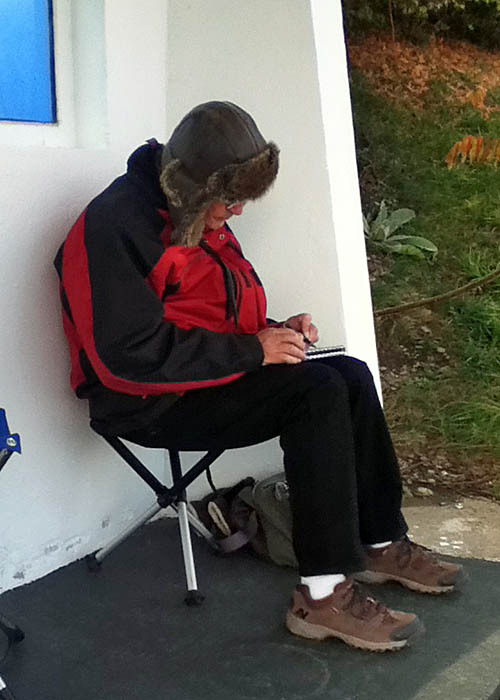 But, can an Arizona-bred old guy sketch in the cold. We’ll see, but I’m optimistic. 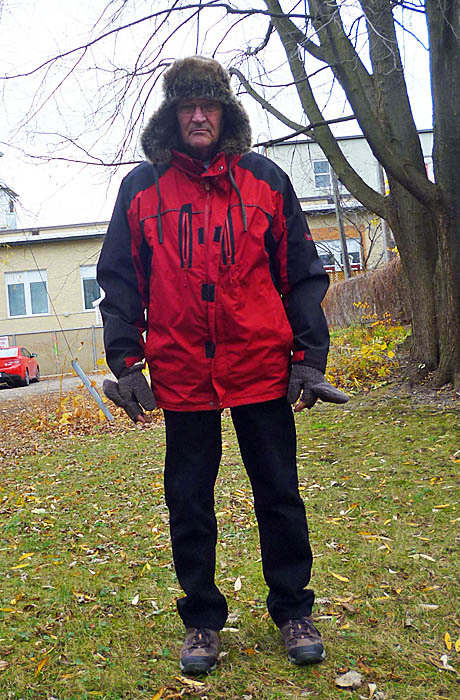 Is this how a well-dressed sketching fanatic faces temperatures that live around zero degrees Fahrenheit? Hope so. I think the sessions will be shorter, and they’ll probably followed by warming myself over a hot cup of tea, but I’m optimistic. Then again, it’s still “warm” here. 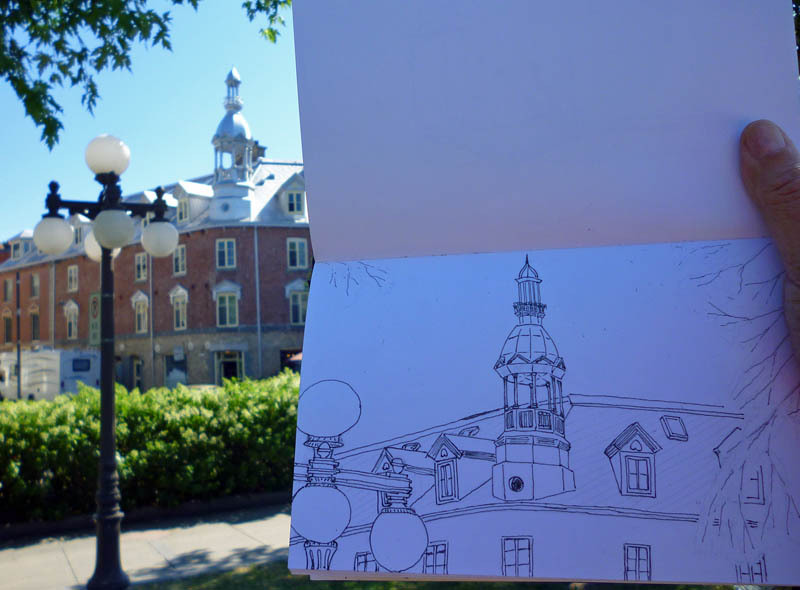 The following photo was taken last weekend as I sketched on the large island next to Quebec City. It was 35F. 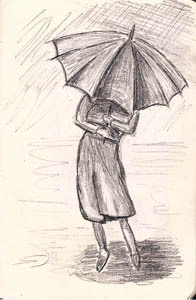 If nothing else, winter will help me sketch faster (grin). What do you do to feed your sketching itch when winter rolls around? Am I nuts? The leaves are falling from the trees and temperatures are heading in the same direction. 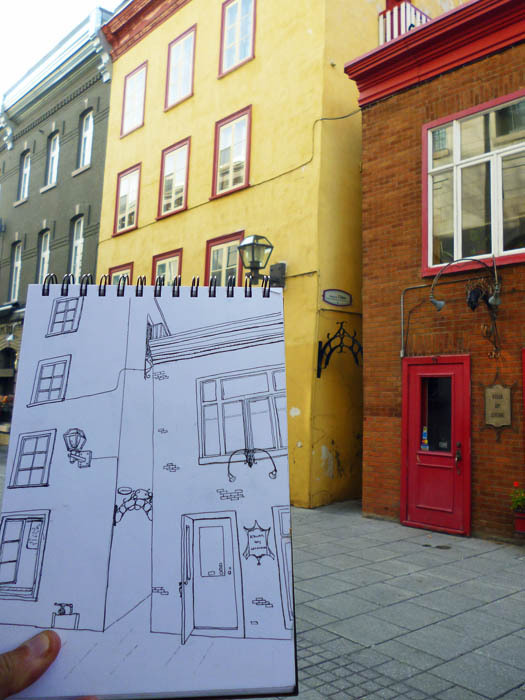 It won’t be long before I won’t be able to stalk the streets of Québec, looking for buildings to sketch. I guess I’ll have to go inside and stalk Quebecers to sketch. But I was out today and walking a street I’d walked many times. Either I’m going blind or this small ‘casse-croute’ (in some places it would be called a chips stand) has just gotten a very bright facelift. In any case today gave me opportunity to capture its essense, which I did. I did the basic sketch on site but decided to come home to do all the signage as I wanted to try out some different tools. To that end, the large sign and the plates of food were done with colored pencils, a medium I have yet to conquer. 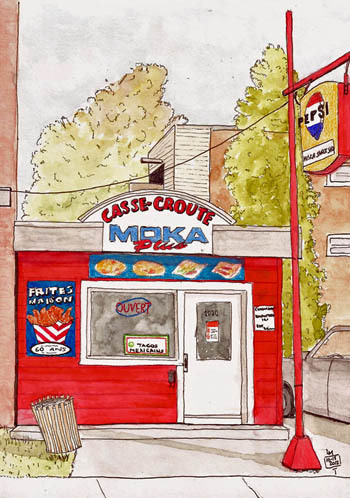 The ‘Frites maison’ sign was done with some Stabilo felt pens I just bought…and like very much for doing such things. 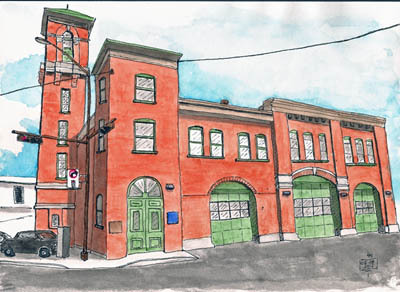 The building’s kinda cute, don’tcha think? 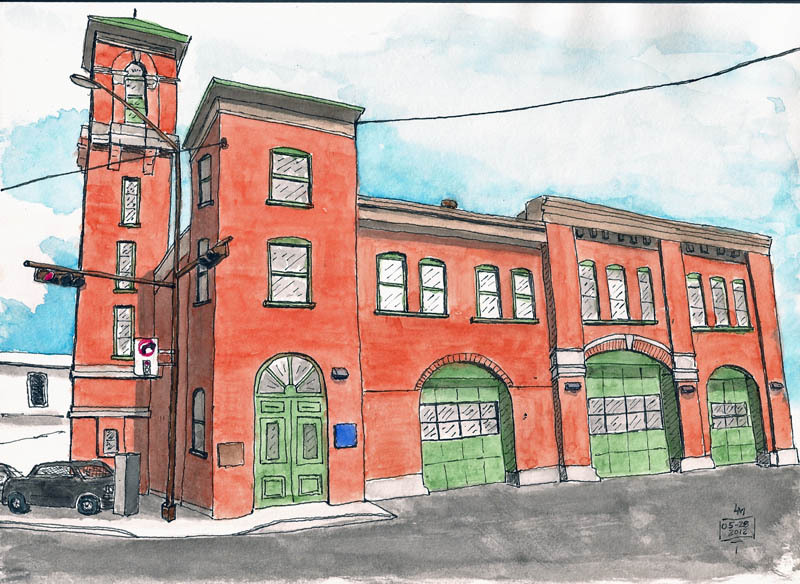 Today we had our second sketchcrawl in Quebec City. 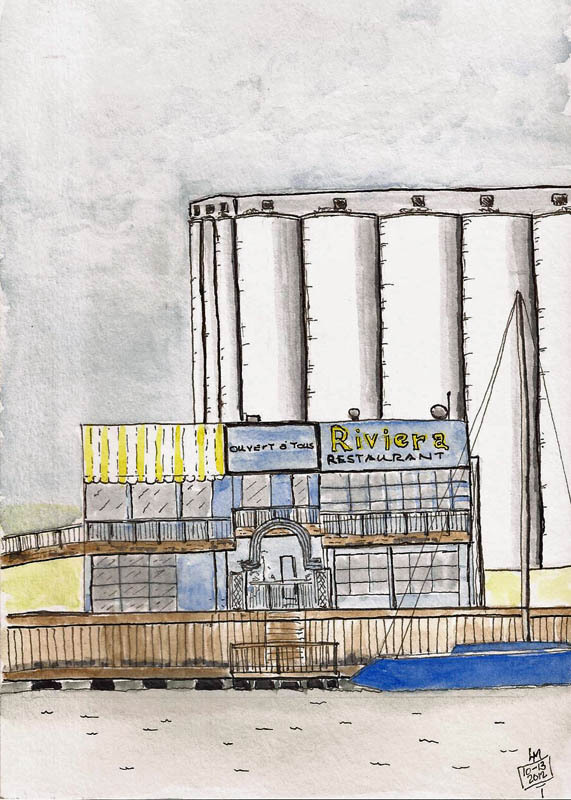 The best description of what went on may come from the fact that I learned a new French verb – “frissonner.” It means to shiver and that’s exactly what I was doing as I tried to sketch a restaurant at the QC marina. That sketch, in all its “frisonner” wavy lines may get finished up but it will occur in my office. Bethann and I were the first to bail out, though others were already huddled against a wall that broke the wind. 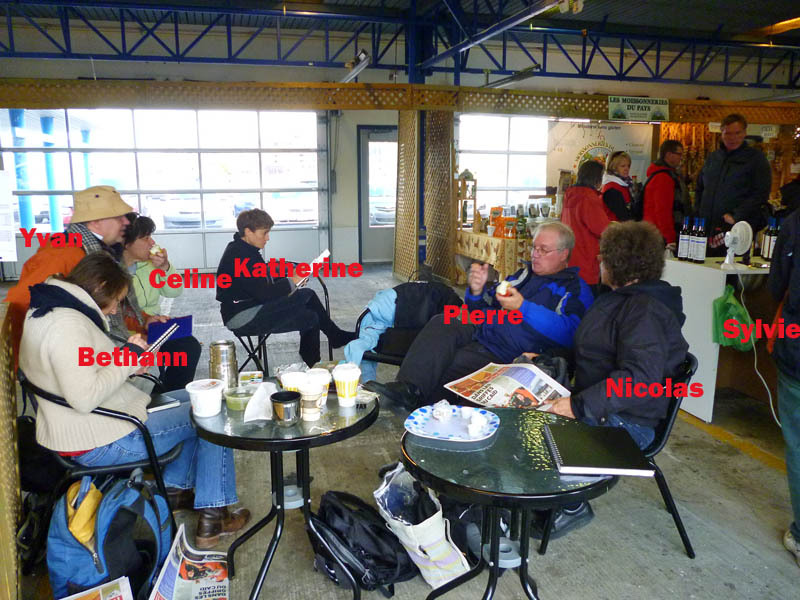 We went into the Marché de vieux port (our farmer’s market), got coffee and Bethann spotted some empty tables and chairs, left behind by summer kiosks, now closed for the winter. We set up shop and couldn’t have asked for a better place to sketch and talk sketching. There was also eating involved. The rest of the group quickly gathered and we were entrenched for the day. Nobody wanted to go outside. If this wasn’t luck enough for anyone, the kiosk next to our “meeting hall” was owned by a very nice woman who sold blueberry syrups and some incredible chocolate/blueberry pieces of heaven. AND she brought us a platter of the stuff. I was walking back from a sketching session last week and I took a slightly different route. I found a new house I want to sketch and a nifty little restaurant that may become a future sketch. But the real discovery was a small “bouquinerie.” In French, a “bouquinerie” is a bookstore that sells used books and I decided to go in to see if they had any cheap books on Quebec architecture or history. They did, but what really caught my eye was a small art section. 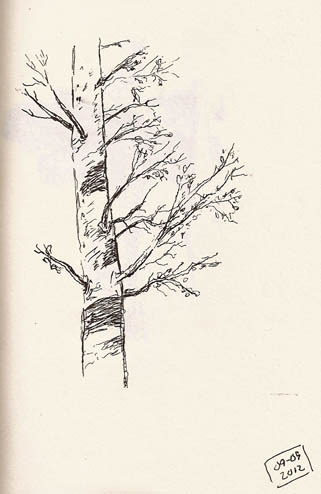 Among the offerings, mostly in French, was a copy of Henry Pitz’s How to Draw Trees. This book was first published in 1956 and redone several times since then. It does appear to be out of print, though you can still buy used copies of it via Amazon, Abebooks and probably elsewhere but the prices run from $30-100. The one I was looking at cost five bucks. I snapped it up and it has launched a new sketching chapter for me, and I haven’t even read the darn thing yet. The sketches are cool, though. I’m not sure how long that chapter will be or what story it will tell, but right now I’m having fun discovering trees. 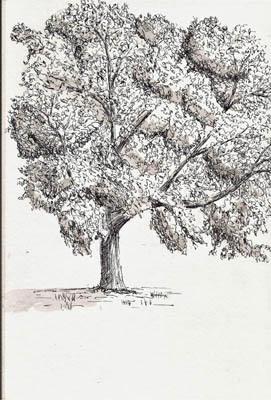 I’ve drawn trees in many of my sketches but I’ve never featured a tree in a sketch. I still have much to learn from this book as I’m still looking at the pictures, but I thought I’d share some of my meager attempts that have sprung from my new-found interest. I started by doing some small sketches in a really cheap, blank notebook I picked up at the dollar store. Until Stillman & Birn decide to produce a small sketchbook, I’m stuck with this less than optimal paper as I really don’t like Moleskine sketchbook paper. Anyways, here’s a sample of my efforts. 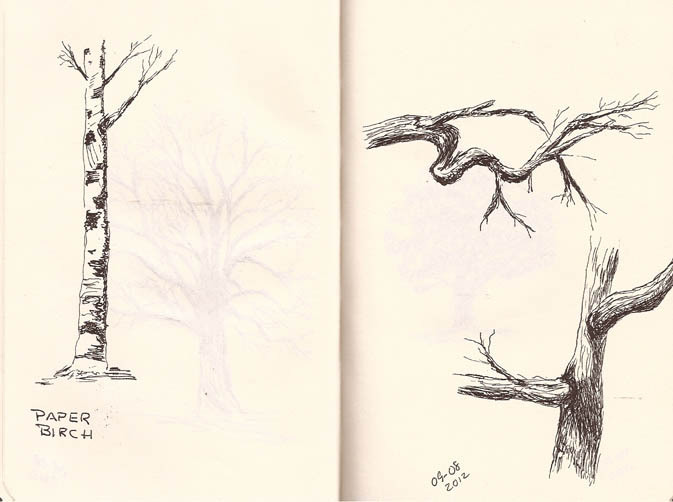 The Plains of Abraham is a natural place to sketch trees – the park has a lot of them representing many, many species. I went there with the idea of capturing a couple ‘likenesses’ of these tall neighbors on our planet. I started in a handmade sketchbook, with Canson Mi-Teintes tan paper. I think this sketch may be improved with a splash of color but for now, this is the result. Proud, but lonely, this tree stands in a very open area of the park. 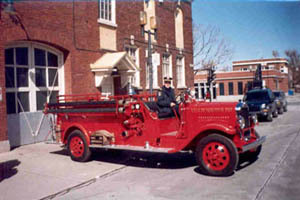 Click on this image for a larger image. 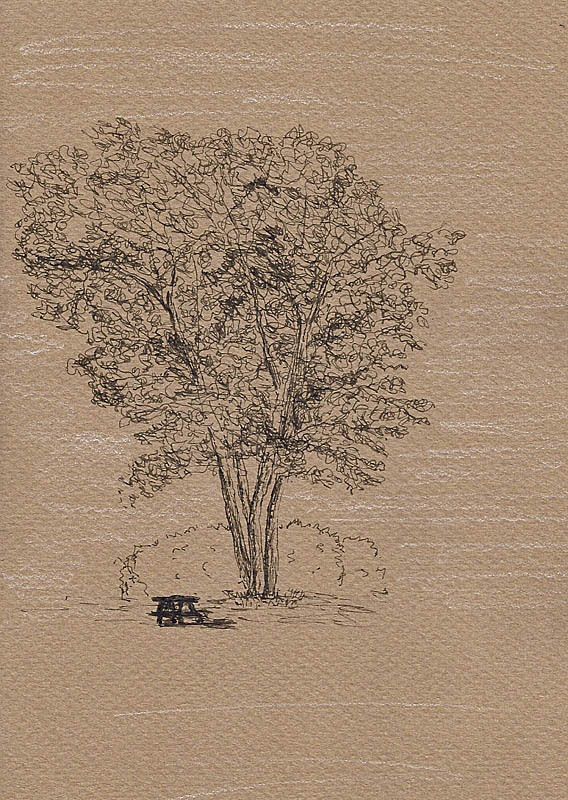 I got out my Stillman & Birn Beta sketchbook (6×8) and moved to a comfy bench in the shade and I sketched this tree. Again, you can get a larger image by clicking on ths small one. I thought that while I had my dollar store notebook out I’d show you a few examples of the doodles I do, often while watching TV. There’s not much to them but I thought some might find them interesting. Anyone have a recommendation for a decent 3×5 sketchbook that isn’t made by Moleskine and is available (without paying as much for shipping as for the sketchbook) to those of us in Canada? 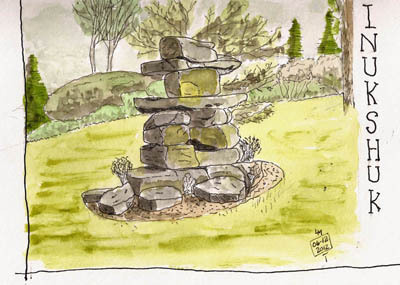 Here’s something you won’t see in many urban sketcher’s sketchbooks, an Inukshuk. The Inuit have used these for years to provide directions, mark locations, and even to aid in caribou hunts. Because of this, you can find these human-like rock piles scattered across the northern parts of Canada… or in souvenir shops, as miniature versions are quite popular. 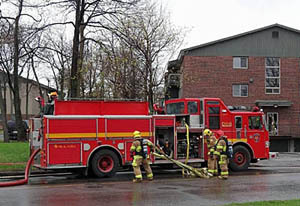 This one, however, is in downtown Quebec City, on the Parliament grounds. I’d guess its height at ten feet. 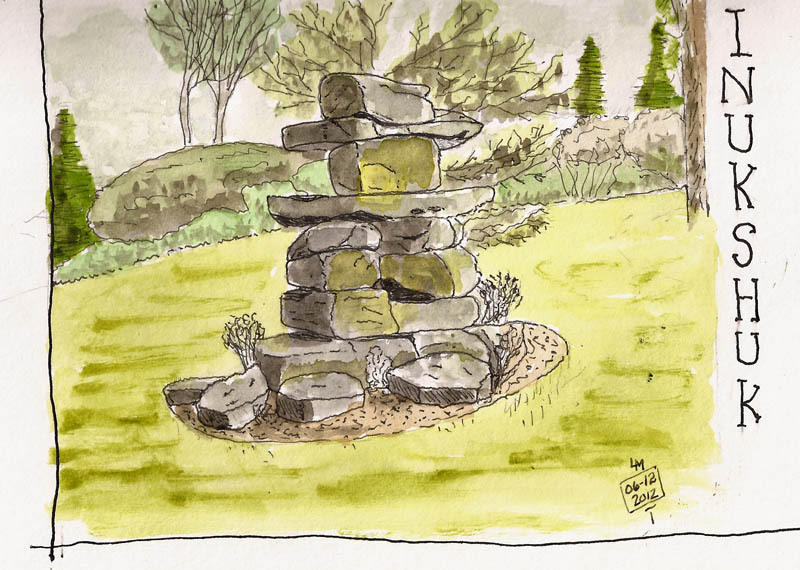 Yesterday wasn’t the optimal time to sketch it as there are barriers up around the grounds due to construction so I couldn’t get as close as I’d like, nor could I view it from its front, the optimal way to sketch an inukshuk (“in-ooo-shuck”). 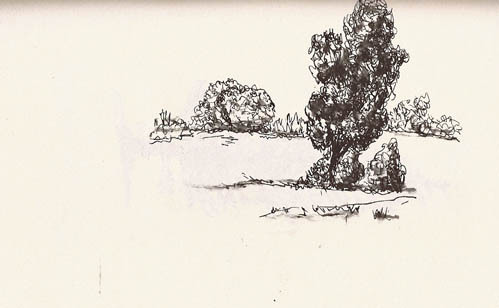 But, I was there; it was there; and I sketched it as, these days, I’m interested in rocks and how to depict them. This sketch was done in a Stillman & Birn Beta (6×8) sketchbook, using a Pilot Prera pen filled with Noodler’s Lexington Gray ink. 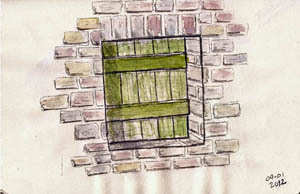 Winsor & Newton artist watercolors provided the color. I REALLY like the Beta sketchbook paper. So thick, so friendly to both pen and watercolor. I’ve become quite spoiled by my Alpha series sketchbooks but the Beta series is yet one step better for the kinds of sketching I do. Any inukshuks in your town (grin)?